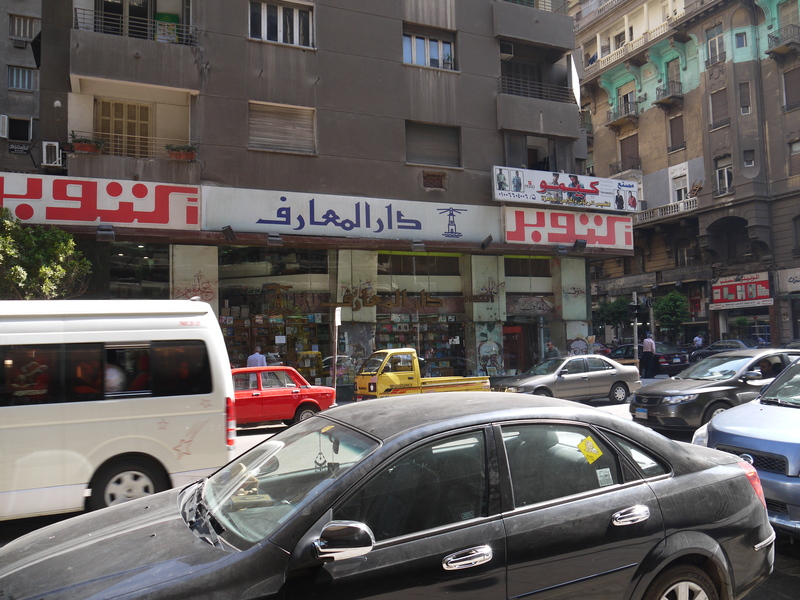 Dar al-Ma’arif branch at the corner of Abd al-Khalek Tharwat and Sherif St. in downtown Cairo. Dar al-Ma‘arif is one of the oldest publishing houses in the Arab world and plays an important role in making readily available new editions of classic works of Arabic literature, scholarship, and translations at affordable prices. Given that most bookstores generally do not carry editions published more than ten years ago (once a book sells out, it often disappears from the market completely unless a new edition is printed), Dar al-Ma‘arif’s role in re-publishing classic works of literature and scholarship is especially important because it keeps this literature alive and available for readers. The house was founded originally as a printing press in 1890 by Lebanese scholar and writer Naguib Mitri and his brother Shafiq. Shortly thereafter the brothers expanded their operations to include publishing, in the process making Dar al-Ma‘arif one of the first private publishing houses in Egypt. The house remained private until 1961 when, in the midst of a larger push by the Egyptian government under Nasser to purchase and control independent publishing houses, Dar al-Ma‘arif became one of the government’s most important publishing houses, a status it retains today. While the house has undergone numerous changes and developments over its more than 120 years of existence, one of the most important came in 1976 with the establishment of the weekly political and social magazine, October. Today the larger umbrella organization, of the same name, prides itself on being morally grounded in its efforts to spread knowledge not just in Egypt, but throughout the Middle East. Library of Literary Studies (Maktabat al-dirasat al-adabiya) – literary criticism, language, linguistics, etc. To find Dar al-Ma‘arif’s books, visit one of their 26 locations located throughout Egypt. Their books are also located at most government-run houses and bookstores, including the General Egyptian Book Organization branches. A popular branch with a good selection is located on Sherif St., catty-corner to GEBO’s bookstore at ‘Abd al-Khalik Tharwat Street. Their website has recently undergone an upgrade and contains pretty up-to-date information about all of their publications and products, as well as a shopping cart and way to purchase texts via the web using MasterCard, Visa, or PayPal.